USS Lake Champlain, a Ticonderoga-class Aegis guided missile cruiser, launched in 1987. Beginning with USS Bunker Hill (CG-52), this version is equipped with the Mark 41 VLS, whereas earlier versions were equipped with the Mark-26 twin-arm missile launcher system. The Aegis Combat System is an American integrated naval weapons system developed by the Missile and Surface Radar Division of RCA, and now produced by Lockheed Martin. It uses powerful computer and radar technology to track and guide weapons to destroy enemy targets. Initially used by the United States Navy, Aegis is now used also by the Japan Maritime Self-Defense Force, Spanish Navy, Royal Norwegian Navy, Republic of Korea Navy and Royal Australian Navy. Over 100 Aegis-equipped ships have been deployed. It is also part of NATO's European missile defence system. The word "Aegis" is a reference that dates back to Greek mythology, with connotations of a protective shield, as the Aegis was the buckler (shield) of Zeus, worn by Athena. 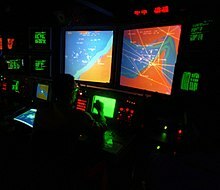 The Aegis Combat System (ACS) is an advanced command and control (command and decision, or C&D, in Aegis parlance) and weapon control system (WCS) that uses powerful computers and radars to track and guide weapons to destroy enemy targets. The ACS is composed of the Aegis Weapon System (AWS), the fast-reaction component of the Aegis Anti-Aircraft Warfare (AAW) capability, along with the Phalanx Close In Weapon System (CIWS), and the Mark 41 Vertical Launch System. Mk 41 VLS is available in different versions that vary in size and weight. There are three lengths: 209 in (5.3 m) for the self-defense version, 266 in (6.8 m) for the tactical version, and 303 in (7.7 m) for the strike version. The empty weight for an 8-cell module is 26,800 lb (12,200 kg) for the self-defense version, 29,800 lb (13,500 kg) for the tactical version, and 32,000 lb (15,000 kg) for the strike version, thus incorporating anti-submarine warfare (ASW) systems and Tomahawk Land Attack Cruise Missiles (TLAM). Shipboard torpedo and naval gunnery systems are also integrated. AWS, the heart of Aegis, comprises the AN/SPY-1 Radar, MK 99 Fire Control System, WCS, the Command and Decision Suite, and SM-2 Standard Missile family of weapons; these include the basic RIM-66 Standard, the RIM-67 extended range missile, and the newer RIM-161 designed to counter ballistic missile threats. A further SM-2 based weapon, the RIM-174 Standard ERAM was deployed in 2013. Individual ships may not carry all variants. Weapons loads are adjusted to suit assigned mission profile. The Aegis Combat System is controlled by an advanced, automatic detect-and-track, multi-function three-dimensional passive electronically scanned array radar, the AN/SPY-1. Known as "the Shield of the Fleet", the SPY high-powered (6 megawatt) radar is able to perform search, tracking, and missile guidance functions simultaneously with a track capacity of well over 100 targets at more than 100 nautical miles (190 km). However the AN/SPY-1 Radar is mounted lower than the AN/SPS-49 radar system and so has a reduced radar horizon. The Aegis system communicates with the Standard missiles through a radio frequency (RF) uplink using the AN/SPY-1 radar for mid-course update missile guidance during engagements, but still requires the AN/SPG-62 radar for terminal guidance. This means that with proper scheduling of intercepts, a large number of targets can be engaged simultaneously. 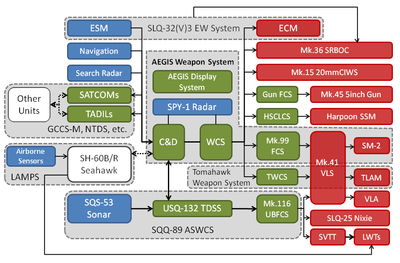 The computer-based command-and-decision element is the core of the Aegis Combat System. This interface makes the ACS capable of simultaneous operation against almost all kinds of threats. The Aegis Ballistic Missile Defense System (BMD) program is intended to enable the Aegis system to act in a sea-based ballistic missile defense function, to counter short- and medium-range ballistic missiles of the variety typically employed by a number of potential opponent states. As of January, 2014, the US and Japan were the only countries to purchase or deploy the Aegis BMD. Aegis was initially developed by the Missile and Surface Radar Division of RCA, which was later acquired by General Electric. The division responsible for the Aegis systems became Government Electronic Systems. This, and other GE Aerospace businesses, were sold to Martin Marietta in 1992. This became part of Lockheed Martin in 1995. By the late 1950s, the U.S. Navy replaced guns with guided missiles on its ships. These were sufficient weapons but by the late 1960s, the U.S. Navy recognized that reaction time, firepower, and operational availability in all environments did not match the anti-ship missile threat. The new threat of Soviet anti-ship missiles exposed a weakness in contemporary naval radar. The requirements of both tracking and targeting these missiles was limited by the number of radars on each ship, which was typically 2–4. In 1958 the navy started the Typhon Combat System, a prophetic program culminating in the futuristic but unreliable AN/SPG-59 phased array radar, which was never made viable and was canceled in 1963 to be replaced by the Advanced Surface Missile System (ASMS). As a result, the US Navy decided to develop a program to defend ships from anti-ship missile threats. An Advanced Surface Missile System (ASMS) was promulgated and an engineering development program was initiated in 1964 to meet the requirements. ASMS was renamed "Aegis" in December 1969 after the aegis, the shield of the Greek god Zeus. The name was suggested by Captain L. J. Stecher, a former Tartar Weapon System manager, after an internal U.S. Navy contest to name the ASMS program was initiated. Captain Stecher also submitted a possible acronym of Advanced Electronic Guided Interceptor System although this definition was never used. The main manufacturer of the Aegis Combat System, Lockheed Martin, makes no mention of the name Aegis being an acronym, nor does the U.S. Navy. In 1970 then–Captain Wayne Meyer was named Manager Aegis Weapons System. Under his leadership the first systems were successfully deployed on various US Navy vessels. 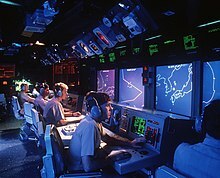 Large screen displays on USS John S. McCain, circa 1997. Destroyers have two displays while cruisers have four. The first Engineering Development Model (EDM-1) was installed in a test ship, the USS Norton Sound, in 1973. During this time frame, the Navy envisioned installing the Aegis Combat System on both a nuclear-powered "strike cruiser" (or CSGN) and a conventionally-powered destroyer (originally designated DDG 47). The CSGN was to be a new, 17,200 ton cruiser design based on the earlier California and Virginia-class cruisers. The Aegis destroyer design would be based on the gas turbine powered Spruance class. When the CSGN was cancelled, the Navy proposed a modified Virginia class design (CGN 42) with a new superstructure designed for the Aegis Combat System and with a displacement of 12,100 tons. As compared to the CSGN, this design was not as survivable and had reduced command and control facilities for an embarked flag officer. Ultimately this design was also cancelled during the Carter Administration due to its increased cost compared to the non-nuclear DDG 47. With the cancellation of the CGN 42, the DDG 47 Aegis destroyer was redesignated as CG 47, a guided missile cruiser. The first cruiser of this class was USS Ticonderoga, which used two twin-armed Mark-26 missile launchers, fore and aft. The commissioning of the sixth ship of the class, USS Bunker Hill opened a new era in surface warfare as the first Aegis ship outfitted with the Martin Marietta Mark-41 Vertical Launching System (VLS), allowing a wider missile selection, more firepower, and survivability. The improved AN/SPY-1B radar went to sea in USS Princeton, ushering in another advance in Aegis capabilities. USS Chosin introduced the AN/UYK-43/44 computers, which provide increased processing capabilities. During 1980, a destroyer was designed using an improved sea-keeping hull form, reduced infrared and radar cross-sections, and upgrades to the Aegis Combat System. The first ship of the Arleigh Burke class, USS Arleigh Burke, was commissioned during 1991. The Multi-Mission Signal Processor (MMSP) provides Anti-Air Warfare (AAW)/Ballistic Missile Defense (BMD) multi-mission capability for the first 28 ships (DDGs 51–78) of the US Navy's Arleigh Burke-class destroyers as part of the Aegis Open Architecture Modernization Program. This capability will also be incorporated in USS John Finn and following new construction, and as well as Aegis Ashore. MMSP modifies transmitters of the SPY-1D radar to enable dual-beam operation for reduced frame times and better reaction time, and provides stability for all D(V) waveforms. The SPY-1 radar system detects, tracks, and supports engagements of a broader range of threats. MMSP improves performance in littoral, ducted clutter, electronic attack (EA), and chaff environments and provides greater commonality in computer programs and equipment. This will result in the merger with Aegis Ballistic Missile Defense System. In 2010 it was reported that Aegis radar systems on board some individual warships were not being maintained properly. A Navy panel headed by retired Vice Adm. Phillip Balisle issued the "Balisle report," which asserted that over-emphasis on saving money, including cuts in crews and streamlined training and maintenance, led to a drastic decline in readiness, and left Aegis Combat Systems in low state of readiness. As of 2016, the ACS is vulnerable underwater. With the proliferation of ever more stealthy submarines, this is an issue of great concern for the US Navy. The Aegis system was involved in a disaster in which USS Vincennes shot down Iran Air Flight 655 in 1988 resulting in 290 civilian deaths. Iran Air Flight 655 continuously squawked Mode III identification, friend or foe (IFF) in duration of flight Iran Air Flight 655 reportedly squawked Iranian F-14 Tomcat on Mode II IFF for a moment; personnel proceeded to re-label the target from "Unknown Assumed Enemy" to "F-14"
The Japanese Maritime Self-Defense Force operates six AEGIS ships comprising the four Kongō-class destroyers the entered service from 1993 and two improved units known as the Atago class from 2007. Two new Maya-class destroyers are currently being built. The Spanish Navy is currently operating five F100 Álvaro de Bazán-class Aegis frigates, and starting it 2024 it will operate the Aegis-equipped F110 class frigate  as well. The Royal Norwegian Navy has acquired five Spanish-built Fridtjof Nansen-class frigates equipped with the AEGIS system, with the first, the HNoMS Fridtjof Nansen entering service in 2006 and the last, the HNoMS Thor Heyerdahl, in 2011. Republic of Korea Navy currently operates three Sejong the Great-class destroyer, with the lead ship commissioned in 2008. Three further vessels have been ordered. The Royal Australian Navy is commissioning three Hobart-class destroyers which have Aegis as the core of their combat systems, with two in service and the third due to enter in late-2019. The Australian Government announced that the class of nine Hunter class frigates to be built in the next decade will also be Aegis equipped, but with a tactical interface developed by Saab Australia. Informally, some media refer to the Chinese phased-array radar air-defense destroyers, Type 052C and Type 052D destroyers, as Chinese Aegis. Outside foreign observers retain the usage of "Aegis" mainly for the brand-name Aegis-equipped classes, but Chinese military usage does have some precedent—the dreadnought which was first a single ship in one navy and then eventually a description for a class of warship in general. ^ Originally, the first five ships of the United States' Aegis equipped Ticonderoga-class cruisers were outfitted with Mark-26 twin-arm missile launchers; however, the ships with this system have been decommissioned and are no longer in service. ^ "Aegis Combat System". The Warfighter Encyclopedia. Warfighter Response Center. October 8, 2003. Archived from the original on November 5, 2004. Retrieved August 10, 2006. .
^ "AN/SPY-1 Radar". Retrieved 29 January 2016. ^ "Aegis Ballistic Missile Defense". Missile Defense Agency. US Dept. of Defense. 8 January 2014. Archived from the original on 25 January 2014. Retrieved 30 January 2014. ^ "Aegis Ballistic Missile Defense - Foreign Military Sales". Missile Defense Agency. US Dept. of Defense. 2 January 2014. Archived from the original on 13 October 2013. Retrieved 30 January 2014. ^ "Aegis Cruisers". About.com Careers. Retrieved 29 January 2016. ^ Lockheed Martin. "Aegis Heritage". Presentation. November 20, 2002. ^ Dan Petty. "The US Navy -- Fact File: Aegis Weapon System". Retrieved 29 January 2016. ^ "pr_mission_aegis-live-tracking-041210 · Lockheed Martin". www.lockheedmartin.com. ^ "pr_mission_091610_aegis_bmd · Lockheed Martin". www.lockheedmartin.com. ^ Study says Aegis radar systems on the decline, by Philip Ewing, Navy Times, Wednesday July 7, 2010. ^ "U.S. Navy Seeks Undersea Aegis-like System". Retrieved 29 January 2016. ^ Fogarty, William M. (July 28, 1988). "Formal Investigation into the Circumstances Surrounding the Downing of Iran Air Flight 655 on 3 July 1988". 93-FOI-0184. Archived from the original (PDF) on 6 May 2006. Retrieved March 31, 2006. ^ "Fragatas F-110: presupuestados por ahora 174 millones en I+D+i y su diseño". ABC. Retrieved 24 January 2018. ^ "PLA Navy shows off 'Chinese Aegis' at RIMPAC 2014". 2014-06-19. Archived from the original on 2014-08-14. ^ James R. Holmes, The Diplomat. "'Taipei must admit defeat in the arms race…' - The Diplomat". The Diplomat. Retrieved 29 January 2016. Center For Surface Combat Systems (CSCS) US Navy Combat Systems Training, Dahlgren, VA.
AEGIS Training and Readiness Center (ATRC) US Navy AEGIS Training, Dahlgren, VA.
AEGIS Weapon System MK-7 in the FAS Military Analysis Network. DDG-51 ARLEIGH BURKE-class in the FAS Military Analysis Network. "AN/SPY-1". The Warfighter Encyclopedia. Warfighter Response Center. October 8, 2003. Archived from the original on November 5, 2004. Retrieved August 10, 2006. .
"AEGIS Weapon System MK-7". Jane's Information Group. April 25, 2001. Archived from the original on July 1, 2006. Retrieved August 10, 2006. "MK 7 AEGIS FIRE CONTROL SYSTEM RADAR". FIRE CONTROLMAN, VOLUME 02--FIRE CONTROL RADAR FUNDAMENTALS (PDF). US NAVY. Retrieved August 10, 2006.